How was your Christmas last year? Was it great? Was it less than the best you've ever had? No matter what last Christmas was like for you, all that remains of it is the memories – lots of good memories, we hope. Christmases past, of course, offer us nothing except the memories. But Christmases future offers the opportunity to make each upcoming Christmas the best ever. Everyone knows that Christmas is a time of goodwill. It’s a time when people are happier and kinder (well, except for the occasional Scrooge!). Goodwill is abundant during Christmas because just about everyone is in a festive and joyous mood, in spite of the hectic nature of the holiday season. And the timeless Christmas themes of love and peace help to intensify that abiding sense of goodwill. But there’s no need to wait for Christmas to get into the Christmas spirit. Why not start right now? Is there a better time for family fun than Christmas? 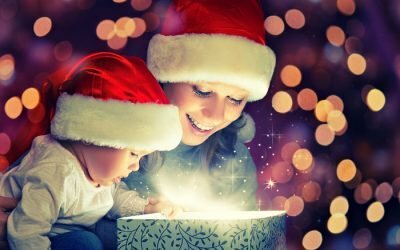 If you sift through your own treasure trove of memories, you'll likely agree that some of your fondest family memories were created during Christmas time. Think about the traditions your family enjoys every Christmas season, and look for ways to make those even more special. Do you have a tradition of hanging stockings on the mantle, for example? Why not make a personalized stocking for each member of the family? Instead of just displaying a name, let each stocking artistically reflect the unique personality of a family member (a great activity for kids!). Or maybe it's time to start some new family traditions. If you've heard of Christmas traditions that other families enjoy, why not start that tradition with your own family this year? Adding a delightful twist to long-time family traditions and exploring new traditions are great ways to amp up the fun for everyone in the family. And it's a great way to create new memories that will be cherished for a lifetime. Most of us spend a lot of money during Christmas. Sometimes we spend too much! But as you plan your Christmas budget, why not allocate a little money for Christmas charities? Many wonderful charities focus exclusively on Christmas. You’re likely to enjoy the Christmas season even more, knowing that you helped to make Christmas more special for lots of people you've never even met. OK, we’ll admit that we’re being a little bit self-serving here, since we sell Christmas lighting and decorations. But the products we sell truly help to make Christmas more special for millions of people around the globe – it’s why we love what we do. You can see it in the eyes of young and old alike as they gaze in wonder at a magnificent display of LED Christmas lights. You can see it in the joy and pride apparent as Christmas Enthusiasts spend hour after hour converting their homes into neighborhood holiday landmarks. You can see it in the fun that your kids have as they hang their favorite holiday ornaments on your family Christmas tree. Christmas, after all, just wouldn't be the same without all the wonderful lights and decorations that help to make Christmas that most special time of year. According to an old saying, you only get out of something what you put into it. At least to a degree, that holds true for Christmas, wouldn't you agree? After all, Christmas doesn't just happen. People make it happen, by doing all the things that people do during Christmas. So imagine if everybody were to work just a little harder at making this Christmas better by focusing on the key areas that make Christmas special. It would be the best Christmas this old world has ever seen!